Halliwell Country Inn, with it’s original homestead dating back to the 1830’s, was originally a fortified wagon stop. Our chapel was originally a “Smithy” where wagons were repaired and horses shod. 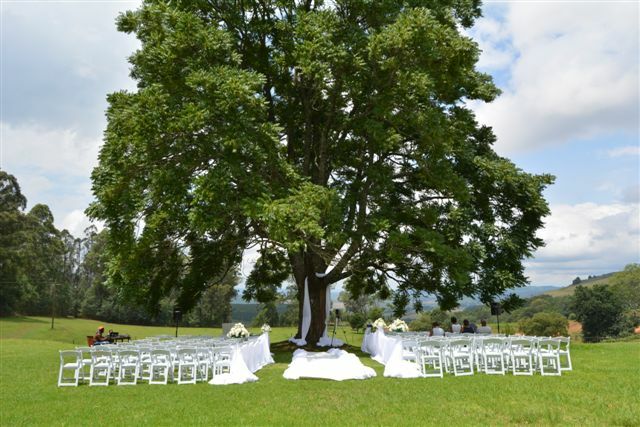 Today we reflect a picturesque country hotel set on 250 acres of open lawns and incredible views of the Karkloof Valley. Our neighbours, the Halliwell Rest Home for Horses, ensure a constant view of these beautiful animals enjoying the beautiful pastures and fresh air on offer. 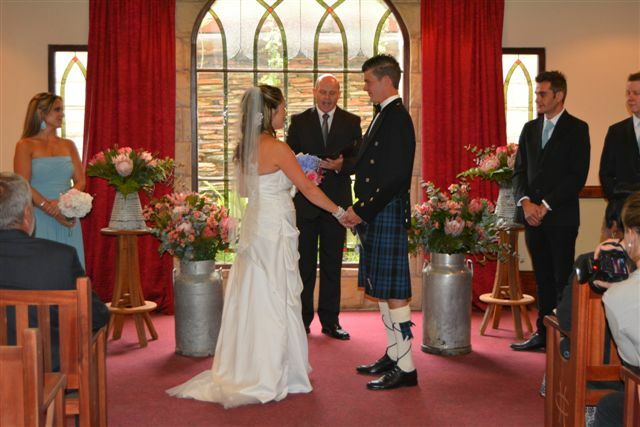 Our wedding venue, set just behind the main building, can accommodate up to 280 guests. 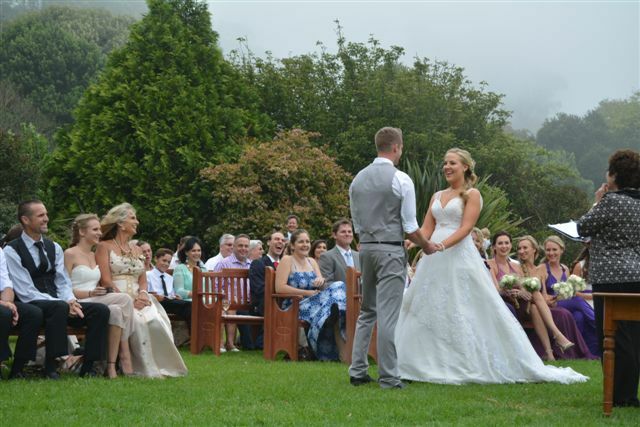 This special venue, opens up onto our beautiful gardens and allows our guests to either use the neighbouring chapel for your ceremony or if you prefer, a beautiful, intimate garden wedding with the Karkloof Valley as your backdrop. Our reception venue, with varying shades of creams and whites, can have our draping moved to create the intimate space you require. To align to the venue, we offer 15 rooms on site, a swimming pool as well as a fully operational A La Carte restaurant serving breakfast, lunch and dinner. 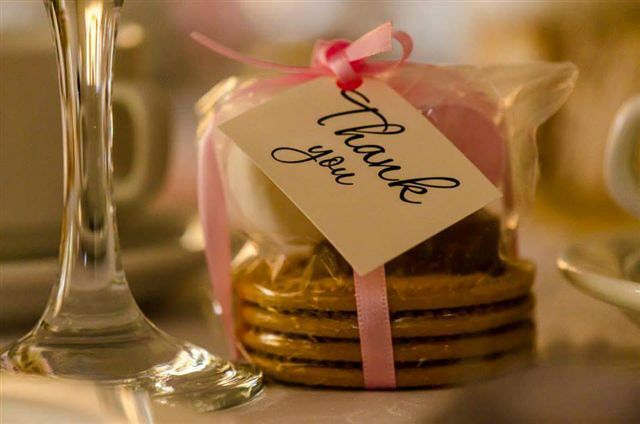 We also offer catering for events pre and post your wedding to ensure all aspects in planning the wedding are covered. 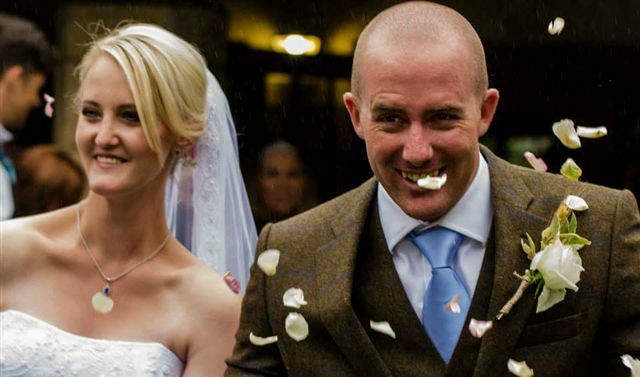 Our wedding packages allow for all contingencies, so if a garden ceremony is what you want but the weather turns foul on the day we can use the chapel, if canopies and Pimms were to be served at the poolside gazebo we can switch to the hotel dining room if available or the cosy pub. We plan our prices around your needs and allow for changes relating to weather at no additional cost. 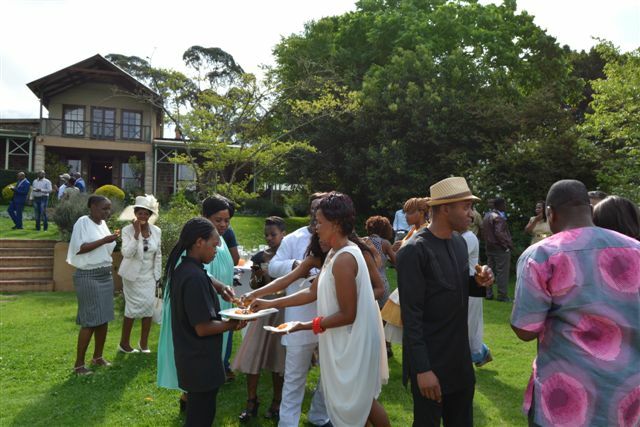 From small intimate gatherings to extravagant celebrations of 300 guests or more, Old Halliwell has the package just for you. The Chapel: Can be used for the ceremony and can seat 120 guests with standing room for another 30 guests. Main Venue: This high roofed light and airy insulated building with a clear 450 square meters of wooden floor space, has it’s own kitchen, bar, ample toilets, heated if required and can be partitioned off to cater from 45 to 320 guests depending on your requirements. 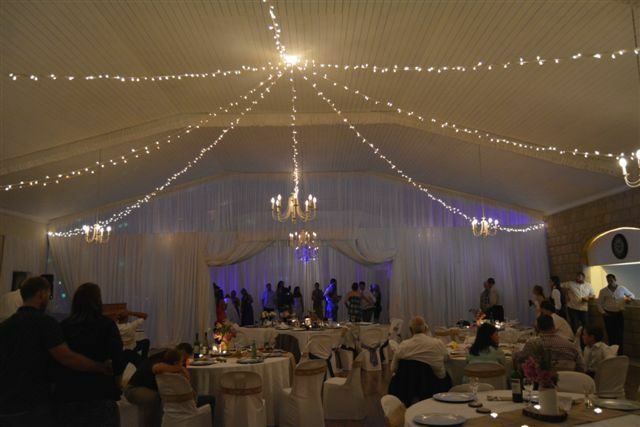 The hall has draped areas and windows with fairy lights built into the ceiling, variable lighting to create the right effects as the reception progresses and excellent acoustics. 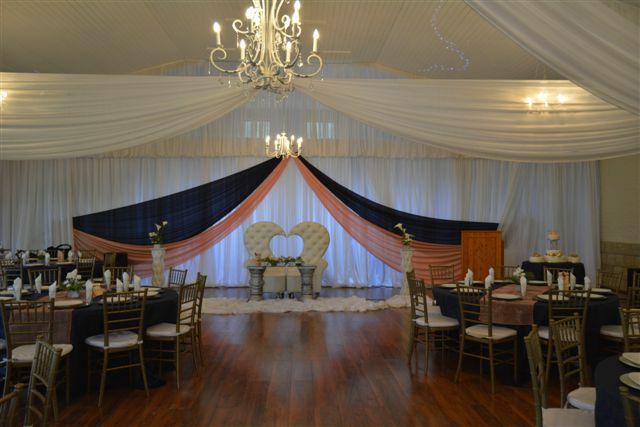 The standard décor in both the chapel and Main venue is certainly adequate, however provision is made for the easy addition of more elaborate draping, bunting, lighting etc. 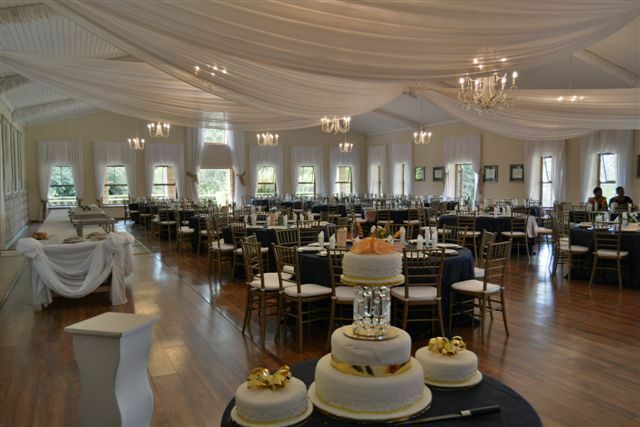 The Chapel, gazebo or hotel dining room can also be used for receptions of 45 or less and budgeted accordingly. Halliwell has large, comfortable guest rooms, all leading in from the garden with open fireplaces and private verandahs overlooking the Karkloof Valley. We have a total of 14 rooms, which will sleep up to 32 guests although extra beds may be added and some rooms do sleep 4 and our Valley suits have spa baths. All of our room rates include breakfast. 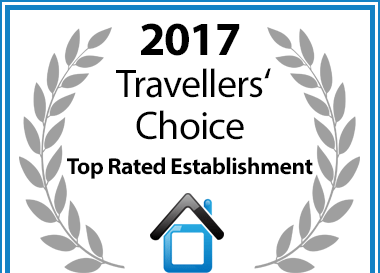 There is also a number of other accommodation establishments within a short drive of Halliwell. Baby sitters are available upon request. Conveniently situated just 4kms from the N3, at the Lions River off ramp, Exit 114. Or tarred road access from Howick 12 kms. 4 ½ hours from Johannesburg Gauteng. 10 minutes from Howick & Midmar Dam. 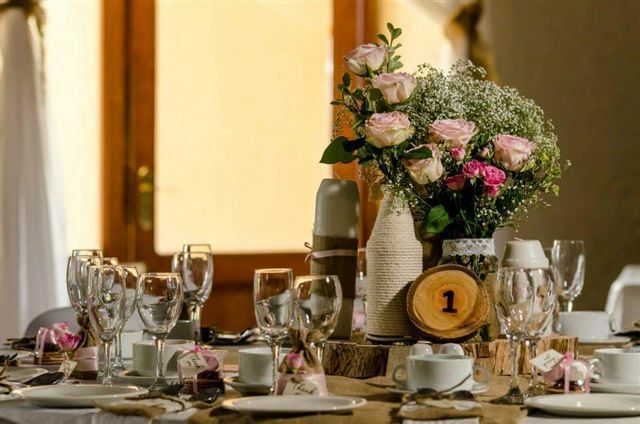 A R1,500.00 deposit is required and held to cover any breakages & damage to linen, property etc this is refunded or part there of 14 days after wedding date. 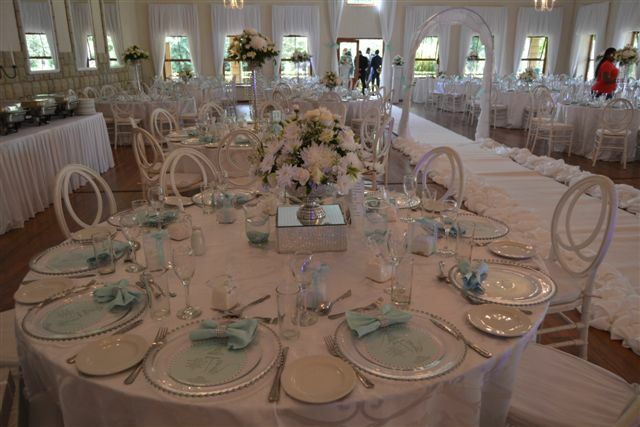 To secure your booking date for the venue we require R9,000.00 which is a non-refundable deposit. It is advisable to secure your venue date early. Confirmation of final number of guests, balance of venue and other related costs including the breakages deposit of R1,500.00 is to be paid no later than 21 days prior to wedding date. This is critical to the smooth running of the wedding. Late or delayed payments are not allowed. 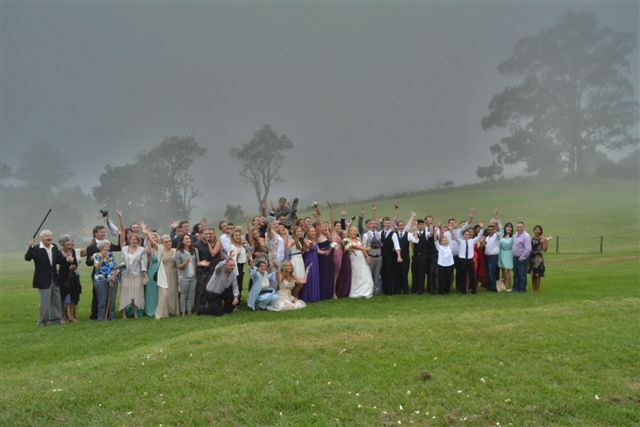 It is advisable to book accommodation for you or your guests at the same time as booking the venue or soon thereafter. Please note that rooms will not be held until the accommodation deposit is received. 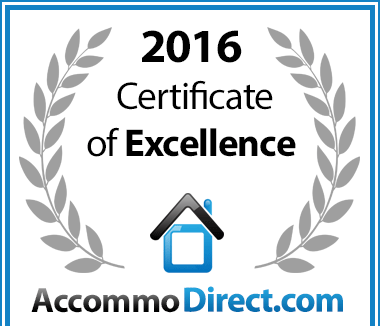 To secure your accommodation a 50% deposit is required and normal cancellation terms apply.